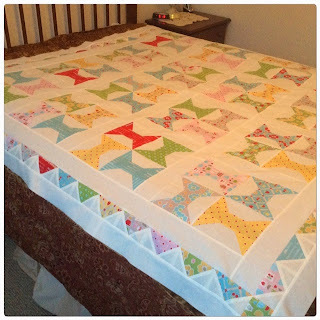 Seashore Quilting: Spool Quilt Top is Complete! Spool Quilt Top is Complete! I really had fun making this one. The pattern was part of a Craftsy class with Joanna Figueroa of Fig Tree Quilts and the fabric is called Bake Sale by Lori Holt. Now I just have to decide what type of quilting pattern I will use. Dog Crate Cover Design in Progress!